The Helford River has over 44 km of shoreline and includes a wide range of habitats, from the exposed rocky coasts at the mouth to the steep sided muddy creeks further upstream. The main river, which is some 9.2 km long, has many creeks running off it, most of which dry to mud at low tide. The tidal area is 568 ha, the intertidal area is 186 ha, and the shoreline is 44.3 km at extreme high water spring level. There are a number of statutory designations covering the habitats of the Helford and is now recognised as one of the best sites in Europe for marine wildlife. The climate is maritime which means there are no extremes of temperature, average winters are mild and hot summers are rare. The river is well sheltered from all westerly winds, but is open to winds from the east. There is very little freshwater input relative to the total volume of water within the river and, generally, mixing would appear to be good. 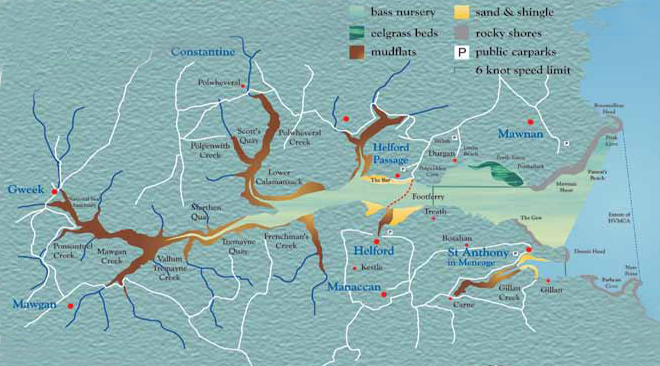 The salinity varies little within the tidal waters except in the upper reaches and creeks after very heavy rain. The estuary is therefore thought of as being marine and may be described as an arm of the sea. The Helford provides winter feeding grounds for a variety of waders and gulls on the adjacent fields and mudflats, while a selection of divers, grebes and ducks can be found in the deeper water near the mouth. Migrant ospreys can be seen each year. Residents include herons, little egrets, kingfishers, shelduck, fulmars and ravens. Common cord-grass (Spartina sp) fringes many of the upper Helford creeks forming dense beds where the roots entrap mud and, as the tides rise and fall, offer rich feeding opportunities to birds such as heron and many fish such as juvenile bass and mullet living in the warm waters. Sand and shingle shores can be found at The Bar at Helford Passage. These shores are of particular interest for the fantastic worm populations, including delicate tubeworms and peacock worms (Sabella pavonina). Peacock worms can be seen in shallow water spreading their fan-like tentacles to catch food. 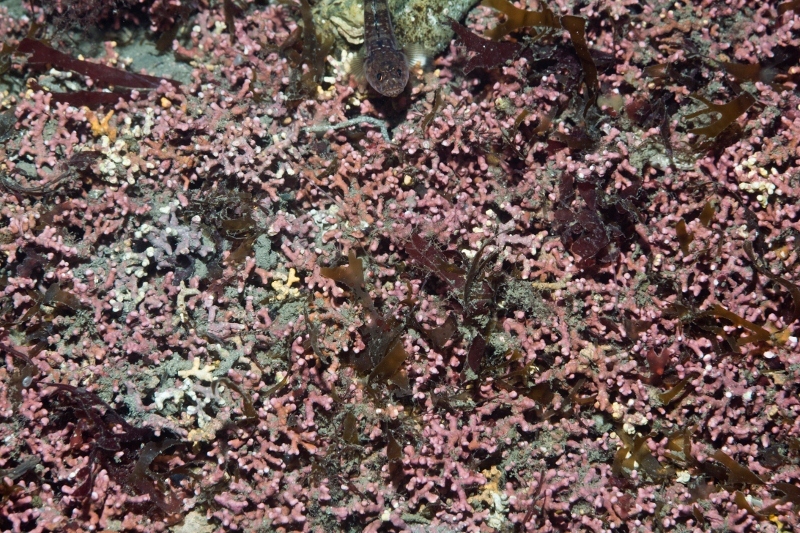 This habitat is also home to sea slugs, razor shells, and the common cockle (Cerastoderma edule). 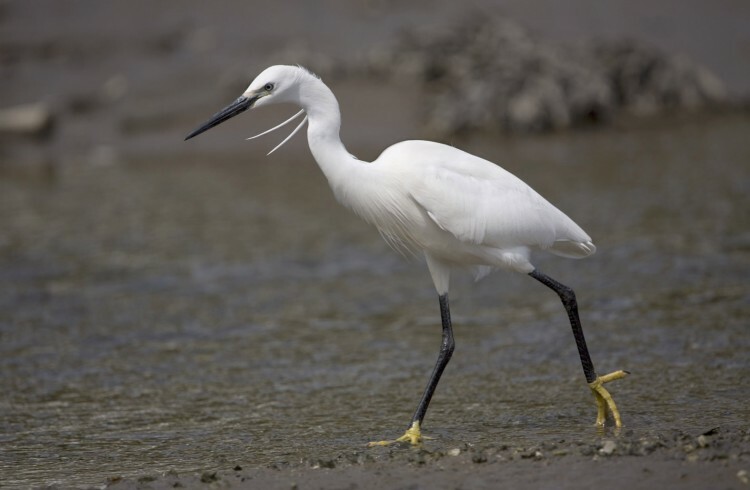 Mudflats are incredibly rich habitats, acting as an important feeding area for migratory birds, which feed on the abundant invertebrate populations living just below the surface. 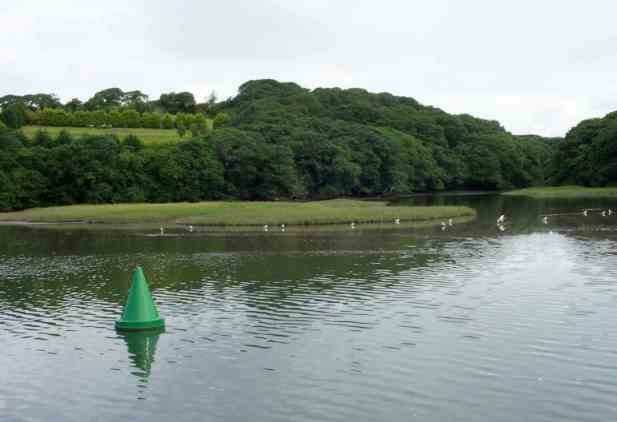 Mudflats can be found at a number of locations around the Helford River in the upper reaches of the creeks, such as Gweek. 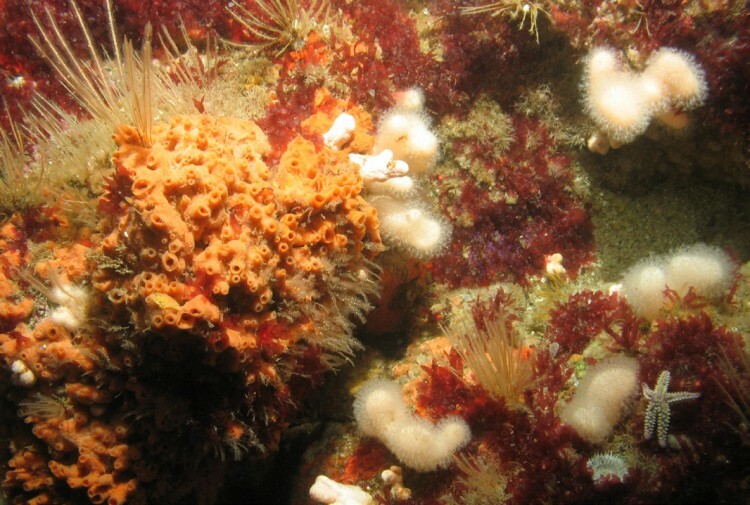 The exposed rocky shores and submerged reefs at the mouth of the estuary are home to a colourful array of sea anemones, star-fish, sea urchins, sponges, sea squirts, lobsters and crabs. Rocky shores can be found in the Helford at Rosemullion Head at the mouth of the river, but rockpools occur as far up the river as Helford Passage. The rockpools have extremely varied wildlife. 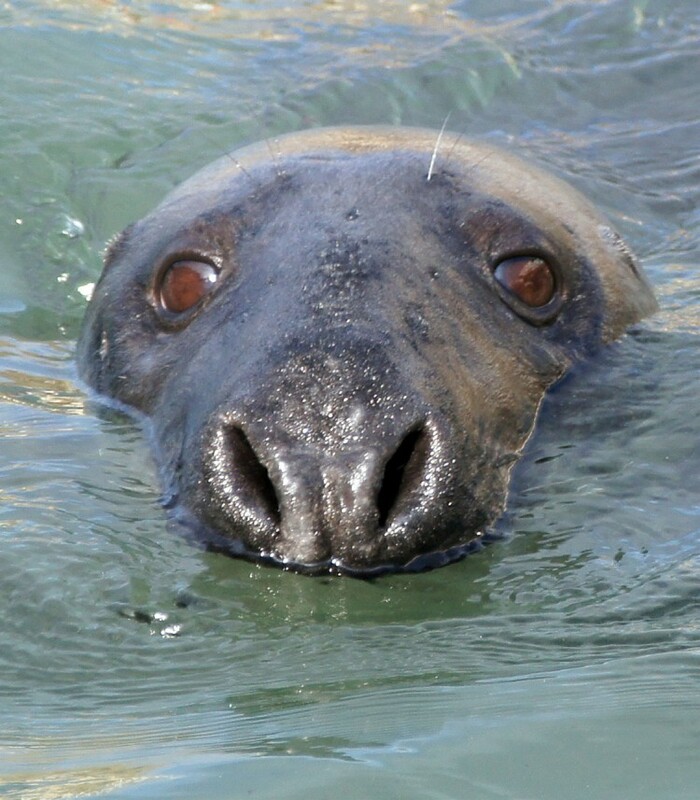 The southerly waters of the Helford also means that species are located here that are not found anywhere else in the country. 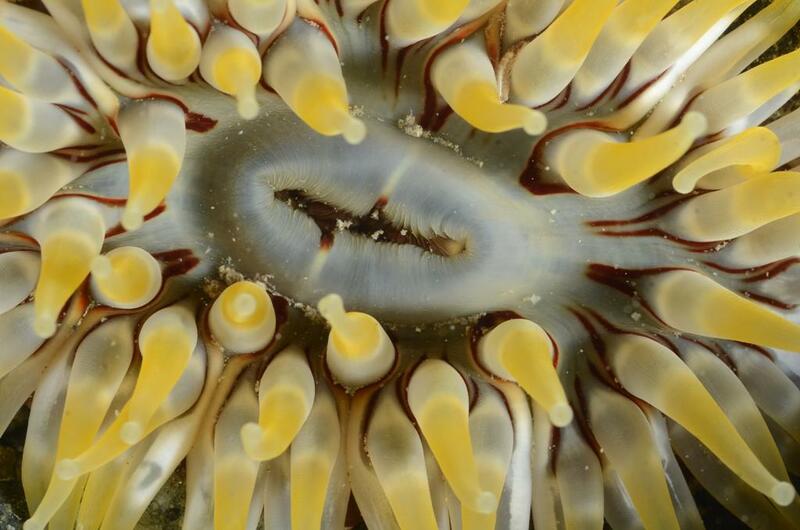 Twenty species of anemone have been found in the Helford River since 1985, including the nationally scarce trumpet anemone (Aiptasia mutabilis) and the ginger tiny anemone (Isozoanthus sulcatus). Species of the kelp can be found on the lower shores and in places can form thick forests. The holdfasts of these can be home to up to 100 different animals, such as sea slugs, marine worms, Couch’s goby, cuckoo wrasse, pipefish, conger eels, bass, lobsters, crabs, and mussels. Certain species occur in specific areas of the shore, dependent on things such as light levels, temperature, and water exposure, creating zonation on the shore. Brown seaweeds show zonation very well. Channel wrack can survive at the very top of the shore, often uncovered for days or longer. It has adapted channels on its fronds that help it to hold in moisture when it lies flat on rocks, with the curled side of the fronds downward. The next seaweed found will be spiral wrack which can also lose a huge amount of water and appear dry and crispy, but when submerged again will revive. Then comes egg wrack and bladder wrack in the middle zone, usually followed by a band of saw wrack on the lower shore. The lower shore species (saw and bladder wrack) are less tolerant of exposure but are fast growers and out-compete the slower growing, smaller wracks like spiral and channel wrack. These have had to make adaptations in order to survive further up the shore where they get a chance to grow. 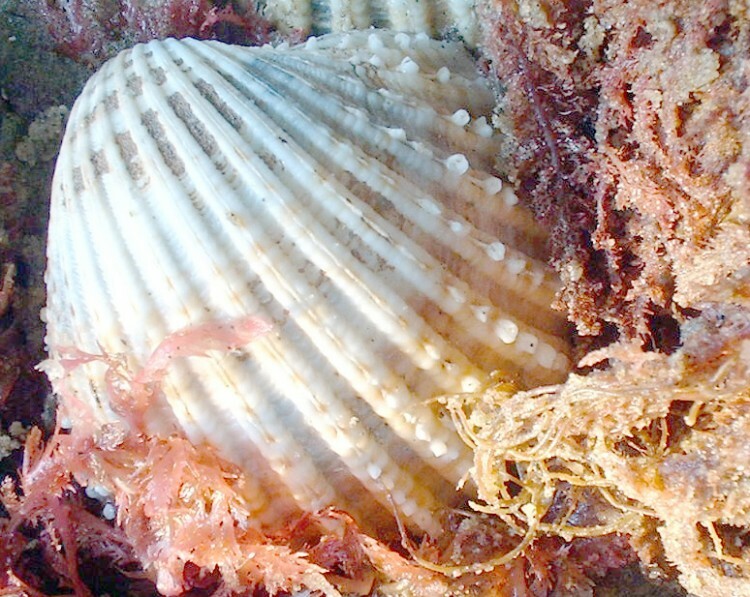 Topshells also show a zonation down the shore. Thick topshells are found on high shores as they can survive the higher temperatures that are associated with being exposed at low tides. Flat topshells are slightly less tolerant so are found in the middle zone, below the thick topshells. Grey topshells like to be submerged most of the time and are less tolerant to high temperatures so they are found in the low shore zone or in rockpools. 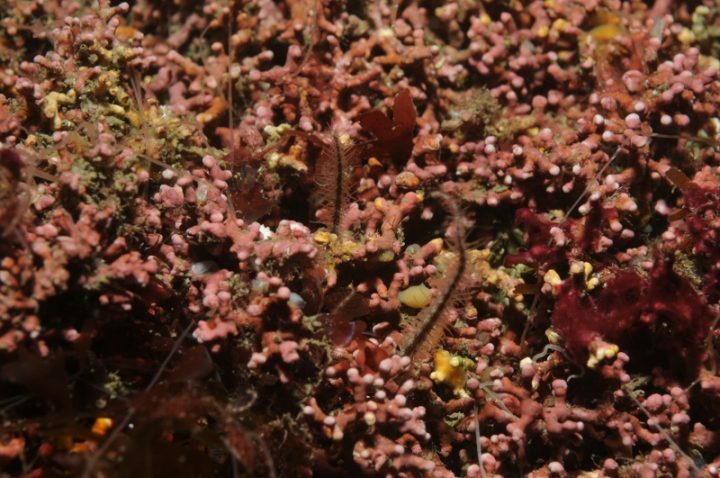 Eelgrass beds can be found in the Helford River off the beaches of Durgan and Grebe. 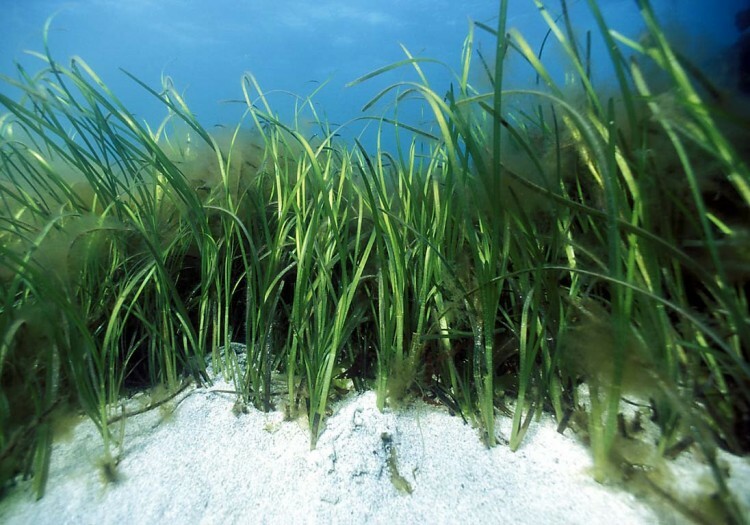 Eelgrass is the only British flowering plant to be found growing in the sea. 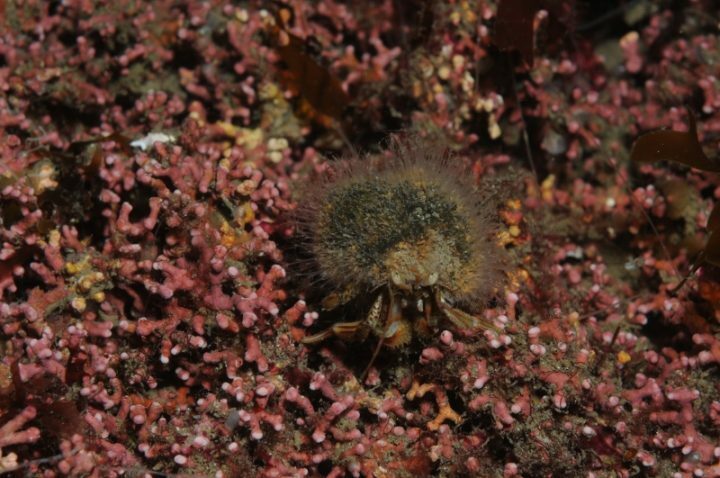 Tufts of green leaves arising from underground stems provide important shelter for crabs, anemones and young fish whilst cuttlefish, sea hares and sea lemons use it to anchor their eggs. Perhaps one day the fascinating little seahorse will be seen again within the underwater meadows. Recently concern has arisen that boat anchors are contributing to bare patches, so attempts are being made to persuade boat owners to anchor elsewhere in the estuary. Zostera marina, to give the scientific name, is a flowering grass that grows submerged in seawater. The tufts of leaves arise from creeping underground stems from which roots reach down into muddy sand. They are easily dislodged by anchors ropes or chains. The broken sections float away with the current and can be seen dying on the strand-line. Colourful anemones, seahorses, fan worms, cuttlefish, strange sea-slugs and delicate hydroids all shelter and feed amongst the swaying eelgrass. 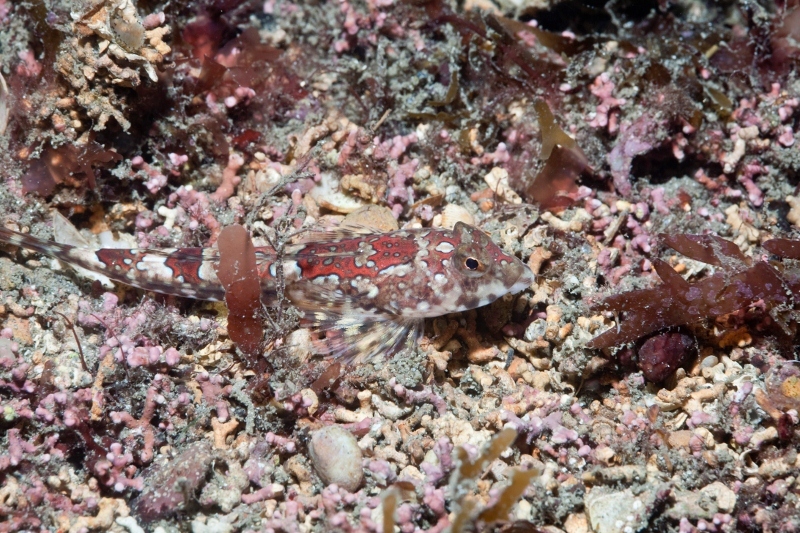 A host of small fish – dragonets, pipefish, various gobies and wrasse as well as many juvenile fish of other species swim and feed in the beds. In the 1980s all the eelgrass has been lost from the intertidal beds in the river below Helford Passage, Treath, Calamansack and Gillan. This is why the remaining beds off Grebe beach are so important. Since 1994 these beds have been recorded and photographed regularly. They are being watched for signs of disease or damage, to see what animals and plants use them and whether the beds are changing.